“Gods And Monsters” is both an example of where season seven of The Vampire Diaries went so wrong and an indication of how the show can pick up the pieces. Taken on its own, it’s a confused jumble of poorly rushed ideas that were never able to fully gain traction and genuinely tender, intimate moments of character interaction. Taken as the conclusion to a very disappointing season, it’s simultaneously frustrating and oddly hopeful. Either way, the prevailing feeling at the end of the episode is one of relief, at the close of the season and also that there are still a few pleasant things left in the show’s tank. The frustrating thing about this episode—and also the story arcs in the back half of the season and the entire season as a whole—is that there never seemed to be a clear grip on where anything was going. New characters were integrated sloppily, plots introduced and discarded with no proper development, and, in the final stretch, a horrible decision was made to create a nonsensical rift between Damon and the rest of the characters. It all added up to a season that felt unmoored and increasingly pointless, which on an often plot-driven show like The Vampire Diaries is the kiss of death for audience involvement. A big part of this is how large of a role using Caroline and Ric’s kids is in the plot, and how woeful that whole story has been up to this point. This is the big moment of truth, where Ric and Caroline lay all their emotional cards on the table and define what they mean to each other, and despite liking both of those characters at one point and theoretically caring about their happiness, not much of their decision to break up really lands. It’s hard to stage a break up when there was never a relationship there in the first place, considering it took place entirely off screen and any on screen moments were filled with the kind of chemistry that screams “WE’RE JUST FRIENDS.” It’s essentially a story that exists solely to get a reunion scene between Caroline and Stefan, and that’s not a good reason for a story to exist. More successful is the place the episode goes with Stefan and Damon’s relationship, because it finally feels like they are in a place where the characters make sense again. 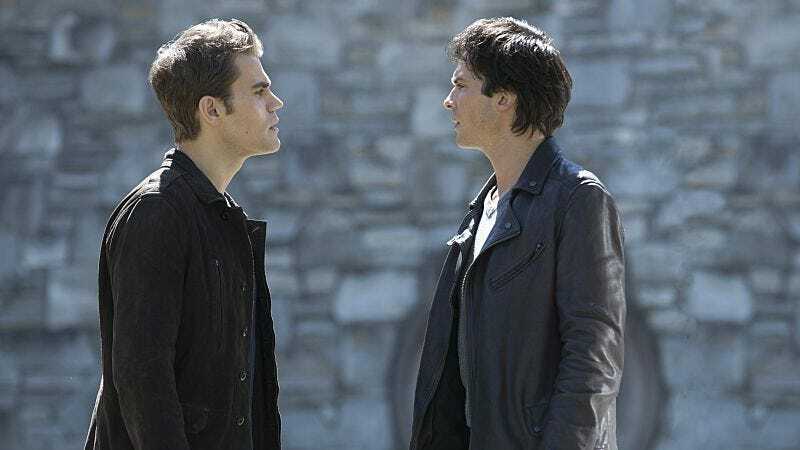 Stefan and Damon getting in a fight about choice versus saving people from their bad decisions is a Stefan and Damon I recognize, and this well-trod fight actually ends up in a different place than it has before, which makes it work. Stefan saying Damon jumps in to save people from their own choices is a choice made out of fear, which feels like a revelation that already came years ago, even if it hasn’t. 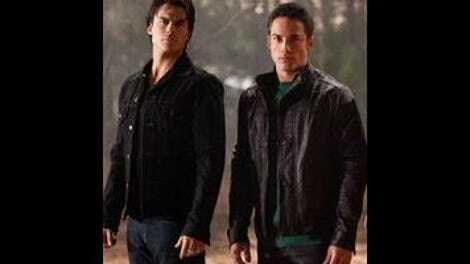 It’s this moment that allows them to finally move past Stefan’s weird hatred of Damon. This would be even better if Damon begging Stefan to let him go and potentially not come back made any sense with what we saw Stefan act like earlier this season when he seemed like he didn’t care if Damon lived or died, but at this point moving beyond that storyline and never turning back seems like the better choice, even if it intermittently means new emotional revelations make a little less sense. Also successful is the continuation of the Bonnie and Enzo relationship, this time culminating in Bonnie almost successfully killing Enzo before Damon manages to kill the final everlasting and break Bonnie from Rayna’s spell. TVD is so low on characters at this point that killing Enzo seemed unlikely, but there was enough raw emotion in the scene to make it work. The most important thing about Bonnie and Enzo’s relationship turns out to be what happens in the end when Damon goes into the vault, hears Elena’s voice, and then refuses to come out. This means Damon is in the thrall of whatever evil was unleashed, and when Enzo goes in to save him he falls under its spell, too. The setup to get to this moment feels scattershot and belabored, and having the good guys possessed by some sort of evil isn’t an original idea, but making those two now-evil guys be Bonnie’s two most trusted people in all the world at least feels like the writers recognizing that the dynamics between those three characters are ones that can potentially be mined next season to create something interesting and meaningful. In the end, the biggest issue with season seven wasn’t that the show couldn’t figure out how to evolve beyond Elena (though I contend the show is still a bit too wrapped up in Elena to ever fully transition beyond her). It’s that the writers couldn’t figure out how to devise an effective villain when Elena wasn’t the center of the action anymore. From Lily Salvatore, to the Heretics, to the Armory, to Damon, to Bonnie, to whatever the hell is in that vault, the idea of who the bad guy was supposed to be was always a moving target they could never quite hit. With Damon and Enzo set up as possessed by the evil that will obviously be the main threat going into season eight, here’s what the writers need to decide: What is this evil? What does it want? And why specifically is this evil interesting and not just a bland killing machine? Despite all of the issues of the season, The Vampire Diaries came out of season seven with most of its strongest character dynamics intact, repairing the strange Stefan and Damon rift and building something genuinely good between Bonnie, Damon, and even Enzo. The key for season eight will be to figure out how to make these character dynamics work while also building the effective villain this season could never quite manage to do. I will never, ever like the device of Caroline writing letters to Elena. Even if the show is literally called The Vampire Diaries, it’s beyond cheesy at this point. The writers never told us what was in the vault because they don’t actually know yet, right? Now it can be whatever they want. Bonnie now has no magic. It feels like we’ve been in this place before. Caroline totally used some extreme emotional manipulation in order to get the kids to siphon the magic. Mother of the year! Until Valerie was mentioned here I honestly thought she was dead, having died bringing Stefan back. Whoops. Also, I guess that means Valerie might be back next season. If anything comes out of this finale, I hope it’s that Matt Donovan is actually out of Mystic Falls and the supernatural business for good. I enjoyed the “aw shucks” humanity Zach Roerig brought to the role, but this season really proved the character has no legs as he is and the writers can’t figure out how to evolve him beyond that. His goodbye scene with Penny was 100 percent unearned by the story that preceded it, but still managed to be decently effective. Run, Matt Donovan! Run like the wind and never come back!